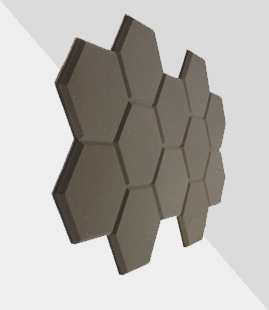 The Ultracoustic Ultra Pad Pro Recoil Stabilizer Acoustic Sound Isolation Platform helps achieve optimal audio performance. The lab-tested and scientifically engineered Recoil Stabilizer eliminates unwanted levels of resonance and helps promote the flow of 'clean' speaker sound projection from your speaker. Stabilization, isolation and absorption gives your audio frequencies free-flow ability with deeper and more natural bass clarity. Simply place your speaker on top of the acoustic stabilizer and fill the room with more accurate and crisp sound. Unlock true audiophile performance with the Ultracoustic Ultra Pad Pro Recoil Stabilizer Isolation Platform. Sold as pair. When your studio monitors sit directly on a stand, desk, or floor, they transmit vibrations that cause the surface they are on to act like a lower-frequency speaker. Ultracoustic Ultra Pad Pro Recoil Stabilizer separates your speakers from their intended stands, stopping the transfer of vibrations. This is called decoupling; it helps you mix more accurately without false low frequencies. You'll be surprised by how much better your mixes will playback on other systems. Works with Studio Monitors, Subwoofers, Loudspeakers, Shelf Speakers, etc. Used by Musicians, Instrument Players, Performers, Sound Engineers, DJs, MC’s, etc. Maximum Speaker Weight Limit: 30 kgs.